Everything you need to dive with us whilst on vacation so you wont need to bring a thing. All of our equipment is in new condition and serviced regularly. Tanks are supplied as part of the cost of the dive. We have aluminium 80 or 63 cft tanks available. Weights are provided on the boat as part of the cost of the dive. We have 2,3,4,5,6 and 8lb weights available. Many customers use integrated BCDs for comfort, if you require a weight belt let us know because we have limited stock of these. 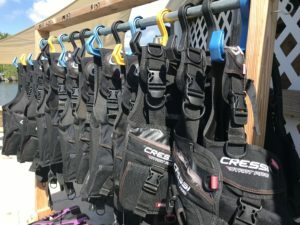 BCDs are supplied by CRESSI. The model we stock is the start pro with integrated, gravity release, weight pockets. BCD also has a pocket on the tank band so you have additional trim weight. We have sizes XXS XS S M L XL. Each size has 3 BCD. Our regulator sets were new this season and we have 12 sets. Each set has a Sherwood Brut Primary and Secondary regulator which are balanced. Each set has a contents gauge, compass and NITROX 2 button computer. Our full suits are stretch fabric for a more comfortable fit. Sizes XXS XS S M L XL XXL XXXL XXXL. We have 2 of each size. You may only rent gear whilst you are diving with us. Please call ahead of your visit if you have any special requirements.